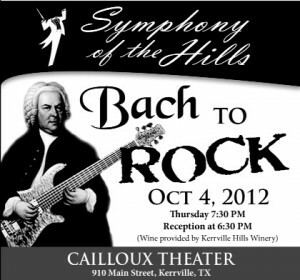 The Symphony of the Hills will open its 2012-2013 season with “Bach to Rock” on Thursday, October 4, 2012, at 7:30 p.m., at the Kathleen C. Cailloux Theater in Kerrville, Texas. This concert is designed to display the musical versatility of the Symphony of the Hills, according to Dr. Jay Dunnahoo, Conductor and Artistic Director. The concert will begin with Brahms’ masterpiece “Concerto in D major for Violin and Orchestra, op. 77,” performed by concertmaster, Long Zhou. Bach will be represented by the well-recognized “Brandenburg Concerto No. 3 in G major,” followed by Tchaikovsky’s “Capriccio Italien, op. 45,” a piece he wrote after a trip to Italy. The concert includes “A Fifth of Beethoven,” a rocking treatment of a classic which became a surprise pop music hit in the 1970s and led to rock renditions of other classical pieces; and selections from “Hair,” the musical that stirred up the stage and American culture in 1968. Guests are invited to a free pre-concert reception starting at 6:30 p.m. Wine will be provided by Kerrville Hills Winery. Good seats remain at several pricing levels, and may be purchased online at www.symphonyofthehills.org, by calling the Symphony office at (830) 792-7469, or via Email: info@symphonyofthehills.org. Upcoming concerts are: “Christmas Through the Ages” on December 6, 2012; “Pops Symphony” on January 12, 2013; “If the Schu Fits” on March 7, 2013; and the “Symphony’s Greatest Hits” on May 2, 2013. Symphony of the Hills concerts are funded through season ticket sales, corporate and individual donations, grants and other assistance, and program advertising. Orchestra musicians come from the Hill Country area and include professionals, Schreiner University faculty, and advanced music students. The Symphony is committed to expanding the appreciation of symphonic music throughout the Texas Hill Country and in developing the musical talents of young people throughout the community.